Knife and knife sheath. The knife has a slightly curved steel blade that is attached to rounded carved wood handle with a worked sheet of brass. The brass is finished in a series of little points at the handle end and incised with series of simple lines, both parallel and diagonal, to form bands. 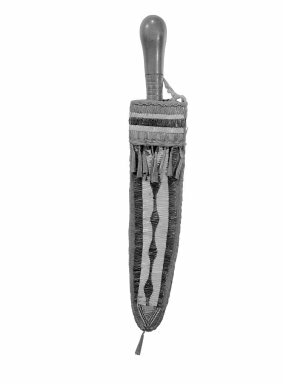 The knife sheath is decorated with porcupine quills in purplish brown, orange, yellow, and natural white in a motif of connecting diamonds. The body of the sheath has an orange triangle with "V" shaped outlines at the very bottom, below the pattern of connected diamonds. The panel or cuff is striped. Many metal cones are suspended from the bottom of the cuff and one single cone, or tinkler is suspended from the bottom tip of the sheath. These 'tin-tinklers' on the panel were once quill-wrapped. The leather is thread sewn so that beige ribbon adorns the panel or cuff.